OSCAR W. ALEXANDER. A resident of Collingsworth County more than a quarter of a century, Oscar W. Alexander is one of the truly conspicuous characters of that section of Northwest Texas. He has been here through all the years of hardship and trying vicissitudes, has weathered out the winds of adversity both physically speaking and financially, and with a wealth of experience such as few men enjoy has found financial success comparatively late in life, He is a veteran Confederate of the great war between the states, has been called to many public offices, but his real success has been won on the farm. In the trying days when settlers were spending more than they earned in the Panhandle district of Texas, he too lost the modest equipment of money which he had brought to the country, but he stuck to his post, renewed his courage and industry, and with the aid of some of his close friends was able to buy the land which he has since cultivated and where he has acquired a competence sufficient for all his future needs, at the same time providing liberally for his family. All his life has been spent within the boundaries of Texas, and he represents one of the very earliest families to come to this country. He was born at Columbus, Colorado County, Texas, June 10, 1843. His grandfather, Amos Alexander, was a Pennsylvanian, and first came to Texas in 1828, when it was a part of Mexico. He selected a tract of land near Columbus, and afterwards in 1834 returned to Texas by sailing ship around the Atlantic to Galveston Island. He occupied his farm only a short time, and then moved to Bastrop, where he built a store and residence out of hand-sawed lumber. While bringing some goods to Bastrop from Columbia he was waylaid by Indians and killed June 1, 1835. His youngest son also was murdered at the same little. The scene of this tragedy was near where Ledbetter stands, and both were buried there. 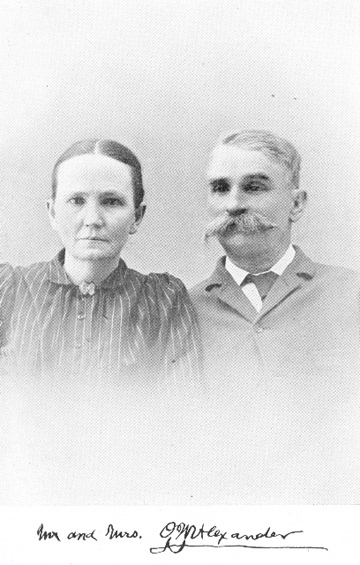 Amos Alexander married Hannah Schmidt, of German parentage, and she is buried near Borden, in Colorado County. They were survived by Lyman W., Amos and Minerva, the last marrying John Hope, and spending her life in Colorado County. Lyman W. Alexander, father of Oscar W., was born in Troy, Pennsylvania, August 1, 1816, and received his education in his native state chiefly by individual study. He came out to Texas with his father in 1828, and later made permanent settlement in 1834. He was one of the Texas patriots in the war for independence in 1835-36. He went from Bastrop County in Capt. Jesse Billingsly 's Company, and in the campaign of 1836 participated at Mission Concepcion near San Antonio, and in other operations around San Antonio. In the spring of 1836 his company was a part of Houston's army. During the famous Runaway Serape he was granted the privilege of Ieaving the army and providing protection for his mother, who was one of' the refugees. and he found her at Liberty, Texas. He then returned to his command, but in the meantime the battle of San Jacinto had just been fought, so that he was not present when independence was practically won. Some years later, after Texas was admitted to the union, he joined the army of the United States in the war with Mexico, and fought at Matamoras and also in some of the engagements leading up to the capture of the City of Mexico. In this war he went from Columbus, Texas, with Capt. C. C. Hubbard' s Company, while one of his brothers was in Hays' Mustang Grays in the same service. During the war for Texas independence he lost all his possessions, and returned to Columbus, where he was engaged in trading and in farming. He dealt extensively in stock and land, and spent most of his active career in Columbus and Fayette counties. For a long time his home was near LaGrange. Later in life he acquired extensive landed interests in Northern Texas, in what is now Greer County, Oklahoma, and to manage them better moved to Gainesville, where he soon died and where the titles to his many tracts of land were burned with the court house in Montague, where he had them deposited for safety. Lyman W. Alexander passed away May 22, 1875, at Gainesville Texas, where lie is buried. He was a democrat, voted for Breckenridge and Lane in 1860, supported secession, and had three sons in the Confederate army. Though not a member, he was friendly toward all churches, and his own leanings were towards the Methodist denomination. His father was a Primitive Baptist. Fraternally he was associated with the Masons, the Odd Fellows, Sons of Temperance and Good Samaritans. At Columbus, Texas, December 30, 1840, Lyman W. Alexander married Jane Gray, a daughter of Robert Cummins, who came from the vicinity of Murfreesboro, Tennessee, was a farmer and married a Miss McKnight. Mrs. Lyman W. Alexander died at Houston, Texas, in 1902, and was buried there. Their children were: Oscar W.; Edwin H. of Llano, Texas; Amos R., who died unmarried in Fayette County; Mollie, who died at Dallas as Mrs. Robert P. Perrin; Minerva J., who married G. G. Lackey and died in Caldwell County, Texas. The youthful days of Oscar W. Alexander were spent in Colorado and Fayette counties. He attended some of the early schools maintained at Columbus, and a still more practical part of his education was received during eighteen months of work in a printing office in LaGrange. He was still a very young man when the war came on, and in 1862 he went to the front from Colorado County with the company commanded by Capt. A. H. Gates of San Marcos. He had begun drilling in 1861, but in March, 1862, first reached the scene of hostilities. He and four others, all of whom had equipped themselves with horses, guns and pistols, joined Terry's Texas Rangers, the Eighth Texas, at Rienzi, Mississippi. He was in the Kentucky campaign of 1862, fighting in thirty-six battles in two weeks, including Mumfordsville, Perryville and Bardstown. He was in the siege of Knoxville, was in the rear of Chickamauga when that battle took place, and near Missionary Ridge and Lookout Mountain at those notable engagements. He participated in the Atlanta campaign of one hundred days, his command was, at Dalton, Georgia, for a time, and then went on to the East into North Carolina, and surrendered at Goldsboro, in that state, April 26, 1865. At Aiken, South Carolina, he was wounded February 11, 1865, but was never captured. The horse he rode was twice shot and he used three different horses during the war. In later years Mr. Alexander was an active member of the Confederate Veterans and has been adjutant of E. C. Walthal Camp, U. C. V., at Wellington. When the war was over and he returned to civil life, he took up the vocation of carpenter at Osage, Texas, where he remained about three years. He then married and took up farming there, but on October 16, 1889, arrived in the Texas Panhandle. The first railroad had only recently been built, and he was among the early settlers who rushed in to occupy the land following the advent of railroads. During a few months spent at Vernon he put in a crop, and then came on to Collingsworth County. This county had only a few families at that time. The county was organized September 20, 1890, only eighty-seven votes being cast in the first election. Mr. Alexander was one of the leaders in the movement for the organization, and was chosen the first county surveyor, an office he filled four years, following which he was deputy district and county clerk for six years, and was then again elected county surveyor and remained in that office eight years. His work as surveyor comprised the laying out of land lines and also the state roads from the county seat in the direction of the county seats of adjoining counties as far as his own county line. On November 30, 1890, he also located the courthouse foundation. Although without special preparation for surveying, he applied himself to the technical details and soon became proficient, and it was his ability and also the urging of men of important property and influence that persuaded him to remain in the office so long. Mr. Alexander is still owner of a tract of laud on which he filed in 1896. This is situated on Panther Creek north of Salt Fork. In 1907 he moved to his present place, buying a tract of two and a half sections. This has been improved by his cultivation and by extensive buildings, and he is now prosperous and is thoroughly contented with this section of the great Lone Star State. His loyalty to Collingsworth County was well evidenced in those hard years when his neighbors and friends were leaving for what they deemed a better place, "where the winds did not blow." Through all these years Mr. Alexander has been a consistent democrat. In 1892 he was a supporter of James Hogg for governor, and in recent years was an opponent of Senator Bailey. In 1912 he ardently espoused the cause of Woodrow Wilson, and has been well satisfied with his administration both at home and abroad. In the early days of Collingsworth County he was one of the first trustees of the school district which comprised an entire quarter of the county, and his present home is now in the Bean School District. On June 8, 1867, he joined the Masonic Order, and has been one of its faithful members ever since. On August 12, 1863, while in the uniform of a Confederate soldier, and twelve miles south of Rome, Georgia, he was converted and united with the Methodist Church. Since November, 1873, he has been a steward in his local church. Mr. Alexander is a stockholder in the Farmers' Union Warehouse, of which he is manager, and is a stockholder in the Wellington Cemetery Association. At Osage, Texas, February 14, 1868, more than forty-eight years ago, Mr. Alexander married Miss Nannie L. Wilson. Mrs. Alexander, who was one of three sons and five daughters, is a daughter of Colvil and Emeline (Reaves) Wilson, her father having come from Knoxville, Tennessee. Mr. and Mrs. Alexander have the following children: Lyman C. of Dallas, a veteran of the Spanish-American war; Mrs. Mary G. Anderson, twin sister of Lyman,. and living at Wellington, Texas; Lina wife of J. W. Koons of Sanger, Texas; Oscar H., who lives on the home farm; John C. and Nettie, both at home; and Floyd, of Dallas.